We are right in the Nature Park of Sierra de Aracena, province of Huelva, in the South of Spain. 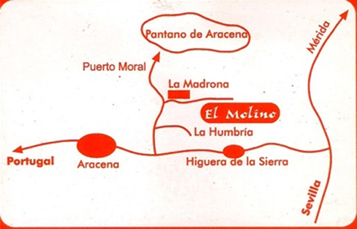 El Molino is a 22 hectare estate in the countryside, surrounded by mounts covered in chestnut trees, cork oaks and centenary olive trees, near the swamp of Aracena. The Ashram is set in an old oil mill, restored employing noble materials (stone and wood). It has 3 meditation rooms, dining room and bedrooms. El Molino or Ashram is a privileged place that meets all the requirements needed to live in peace and tranquility suitable to devote oneself to any activity demanding interiorization and deep transformation. The Ashram is a place renowned by its energetic characteristics as a natural facilitator for all this work aimed at the search for the Self. It is a place possessed of a high level of telluric energy, which encourages in a natural way the elicitation of our own energies.